The Classic Rugged Armor series is now available for the new Xiaomi Mi 9. Encase the new Samsung Xiaomi Mi 9 in a Rugged Armor® for the perfect balance of defense and class. All Spigen products are manufactured with premium materials in a continuous venture to produce quality products that are slim, sleek, and simple. Designed with carbon fiber texture and glossy line accents on a single flexible TPU casing, this rugged protector is also military grade drop tested & certified. Its beveled and raised lip further protects your device from surface scratches. Xiaomi develops smartphones and similar electronic devices. If you have one of their phones, you might want to personalize it with a touch of your own style using a Xiaomi case. You can find several types of cases for Xiaomi phones on eBay, and learning about their features can help you choose the model that suits your needs. 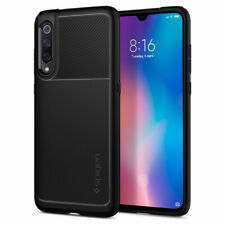 What types of Xiaomi cases are there? 3D - A 3D Xiaomi case uses 3D printing technology and materials as its base components. 3D cases might include raised graphics or logos as well. Bumper - These covers have raised edges at the corners. Bumper cases use these corners as the first point of impact if you drop you Xiaomi phone. Flip - A flip case has a moving front panel. You can rotate the front panel open to use your Xiaomi cell phone without removing it from the case if you wish. Can you choose some features for your Xiaomi case? Kickstand - This feature uses and embedded kickstand to balance the phone while it is inside the case. You can stand the phone on and flat surface to watch the screen without holding it. Screen protector - A screen protector is a clear cover that goes over the front of your phone. It may allow you to see and interact with the phone's screen while leaving the device in the case. Clips or straps - You can use these accessories to customize how you carry your phone. What kinds of materials can you choose from? Xiaomi cases are available for purchase in a variety of materials. You may wish to choose a material based on its appearance, texture, or durability. Some common case materials you can choose from include hard plastic, rubber, faux leather, or canvas. Content provided for informational purposes only. eBay is not affiliated with or endorsed by Xiaomi.